So what does an out-of-work single mom with three kids do in the middle of a recession? If you’re Stephanie Anderson, a self-described “fixer,” you start your own business, of course. And not some “Oh-I’ve-always-wanted-to-work-for-myself” whimsy that may or may not make it. You do your homework: Researching demographics and the best location for your customer base. Seeking out mentors who already made it in your industry so you can learn from their successes and mistakes. You’re that determined entrepreneur with a clipboard in Home Depot comparing every price tag. You also tap into local advisory resources, like the Mercer County SBDC. The result? 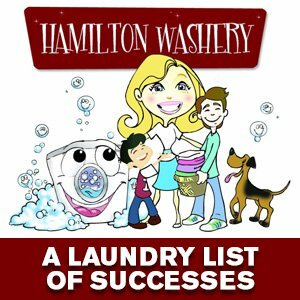 Hamilton Washery. Unlike any laundromat you’ve probably ever seen. Spotless. Comfortable. 56 fully-functioning USA-made washers and dryers. Free WiFi. Three flat screen TVs. A children’s play area. Plus, the most unique amenity of all: Ms. Anderson. “She’s truly one of a kind, always making your day brighter” says long-term client Gayle Leonardo. Yet kicking off the company’s first year wasn’t easy. “Getting financing, getting everything up to code and getting people to change where they did their laundry was a big challenge,” Anderson admits. Four years later, Hamilton Washery continues to expand its services, recently partnering with an offsite dry cleaning company networked through America’s SBDC at the College of New Jersey. As a frequent participant at SBDC events, Anderson has taken advantage of many seminars, free business counseling, legal and bookkeeping consults. “They’re my guardian angels,” she adds.